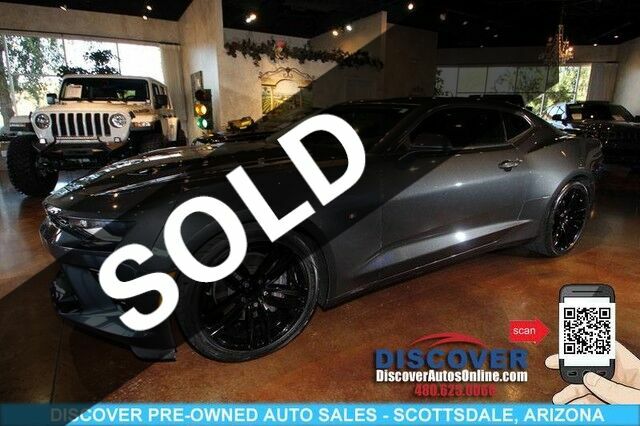 Discover Pre-Owned Auto Sales of Scottsdale Arizona is pleased to offer this beautiful 2016 Chevrolet Camaro 2SS Coupe 2D with only 37,102 miles. CARFAX BuyBack Guarantee is reassurance that any major issues with this vehicle will show on CARFAX report. When you see this car in person, you'll ask yourself "When did WOW become a color of paint?" A test drive can only tell you so much. Get all the info when you purchase a vehicle like this with a CARFAX one-owner report. Marked by excellent quality and features with unmistakable refined leather interior that added value and class to the Chevrolet Camaro Get more for your money with this well appointed vehicle, including a factory warranty. Amazing wheels help set this Chevrolet Camaro apart from other vehicles like it. This Chevrolet includes: WHEELS, 20" Aluminum Wheels JET BLACK, FRONT LEATHER-TRIMMED SEATS Leather Seats EXHAUST, DUAL-MODE, PERFORMANCE LPO, 20" Aluminum Wheels TRANSMISSION, 8-SPEED AUTOMATIC 8-Speed A/T A/T NIGHTFALL GRAY METALLIC ENGINE, 6.2L 8 Cylinder Engine Gasoline Fuel REMOTE VEHICLE STARTER SYSTEM Remote Engine Start AUDIO SYSTEM, CHEVROLET MYLINK RADIO WITH NAVIGATION AND 8" DIAGONAL COLOR TOUCH-SCREEN, AM/FM STEREO WITH SEEK-AND-SCAN AND DIGITAL CLOCK Navigation System AM/FM Stereo Bluetooth Connection Auxiliary Audio Input MP3 Player TIRES, 245/40ZR20 FRONT AND 275/35ZR20 REAR, BLACKWALL, SUMMER-ONLY, RUN-FLAT (STD) Tires - Front Performance Tires - Rear Performance LPO, INTERIOR SPECTRUM LIGHTING, DARK NIGHT *Note - For third party subscriptions or services, please contact the dealer for more information. * At DiscoverAutosOnline.com , we strive to provide you with the best quality vehicles for the lowest possible price, and this Chevy Camaro SS Coupe is no exception. Seats front Sport bucket SS models have "SS" badge on front seatbacks.